Our university was founded in 2006 as the Azerbaijan Diplomatic Academy. However, at present our profile has changed; so, the ADA University actually includes 4 education establishments - the Institute of Engineering and Information Technologies; the Institute of Business; the Institute of Education; and the Institute of International Public Relations. As of last year, we have started the admission to the legal studies programme. Today we are demonstrating Bachelor's and Master’s programmes, language trainings, and long-term educational programmes. This is our second participation in this exhibition, where we want to attract the interest of decent students and improve the image of our university. We have reformed a number of graduate programmes, and each contains an international component that allows students to complete part of their studies abroad; so, one of the graduate programmes provides students with two diplomas from the ADA University and the Dutch Maastrich School of Management. We have established close relations with 63 universities of the world and as part of our cooperation programmes, we send students to study for one semester or for a year abroad. 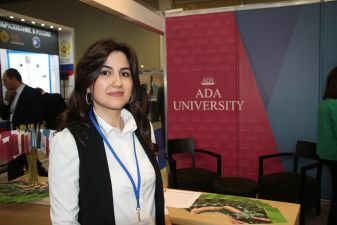 The ADA University is accredited by the Ministry of Foreign Affairs of the Republic of Azerbaijan and we have close ties with foreign embassies. At our university we also have a career management and job assistance centre. Studying at our university lasts for 4 years for those who have TOEFL and IELTS Certificates, and for 5 years for those who have a lower level of English proficiency. At the examinations, we take into account both local (examinations of the State Examination Centre) and international (for Bachelor's programme) standards.